June 21 Saturday Sun shining down very hot all day. Mer stood 86°+ most of P.M. & very warm this eve. All well as could expect, & busy at usual work, I worked half hour picking peas enough for my dinner, over to see Rose's two or three times during day & again of errand in eve - Winnie May here with me part of P.M. (after her mother had been in) & stopped to supper (?) I called to see Vashti Plank & her sister Mrs. Everett (?) down to see Miss Taylor, not at home. Lena gone to (?) 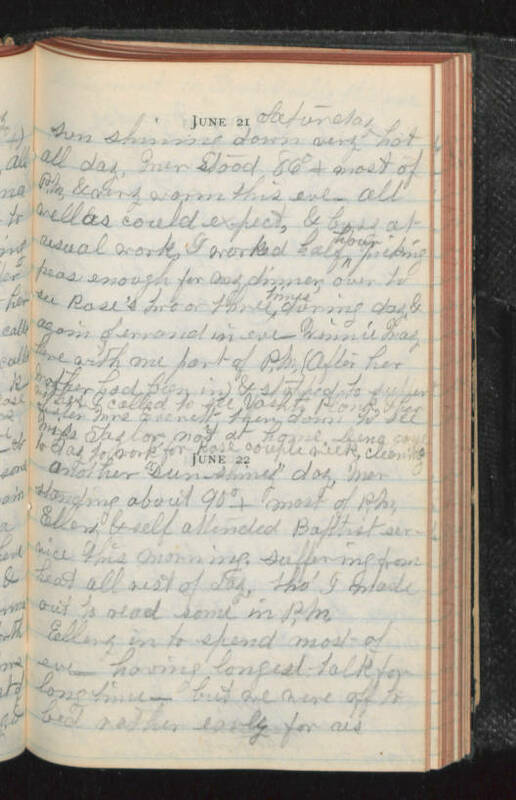 to work for Rose couple week, cleaning June 22 Another "sun-shiny" day, Mer standing about 90°+ most of P.M. Ellery & self attended Baptist service this morning. suffering from heat all rest of day. Tho' I made out to read some in P.M. Ellery in to spend most of eve - having longest talk for long time - but we were off to bed rather early for us.